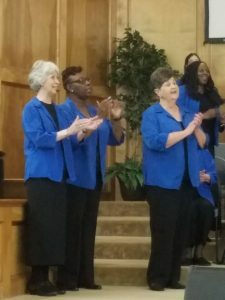 Last week, the Singing Women of Southeast Texas had the opportunity to perform our first full concert of the year at a little church in Grangerland, Texas. 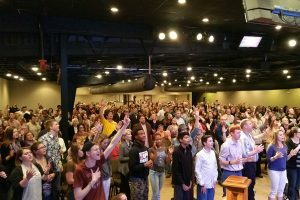 Pastor Jay McIntosh and his wife Kim serve at First Baptist Church faithfully and have cultivated a congregation full of love and service for their small community. On a night that was otherwise cold, damp and dreary, a fire was lit inside with the pounding hearts of forty faithful singers, ten amazing instrumentalists and over one hundred guests. Together, the roof was raised with songs of adoration and praise to our Lord and Savior Jesus Christ. Worship concluded with a musical salute to our country and recognition of military personnel and families, veterans, first responders and flood victims. I can’t think of a better way to spend my Sunday evening. I didn’t know it at the time, but I was actually in the throws of influenza. It is amazing how God provides us that extra dose of strength right when we need it. In fact, the next day I was still basking in the glow of the evening but reality set in by nightfall. I would literally crawl in bed late that afternoon and not emerge for the next three days. I was no longer singing His praises. In fact, I could barely take a breath. Does God understand when we are too tired or too sick to praise Him? Or does our last time carry over until the next? I prefer to think that I have a permanent song implanted in my heart that keeps running even when I cannot sing. Words and notes from songs of faith still drift in and out of my head; sometimes, I even wake up to it. One song from this year’s repertoire that continually swirls around my brain is called Precious Lord, Take My Hand. It was written in 1932 by Tommy A. Dorsey after losing both his wife and newborn son during childbirth. Roy Ringwald’s arrangement of this piece is anointed in that every verse has a unique musical treatment befitting the text. Precious Lord, precious Lord, take my hand. Tommy A. Dorsey gets it. When we get to Heaven—at last! No more pain. No more strife. And God’s love shall rule the land. Now I know the flu seems like small potatoes compared to other stressors and health issues in life, but in the throws of it—when you can’t break your fever or lift your head or do anything for yourself—and especially when the media has warned you that influenza has taken some lives recently, death can seem a little closer than it did a week ago. It seems silly now, but those lyrics were very comforting to me during my respite. I am pleased to say that I have been up for three hours straight this morning with only a light fever. I fully intend to be 100% on my feet by Sunday morning ready to worship again in the house of the Lord! 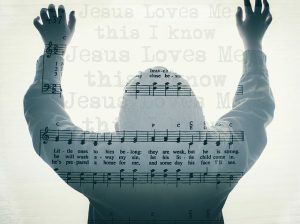 If for some reason I don’t make it, know this: I have enough songs on my Gospel Praise list to last me quite awhile and if that isn’t good enough, I have even more implanted in my Southern Baptist brain to last me until the Lord returns. *please note that this is not found in the Bible! Immediately after Hurricane Harvey, things looked pretty bleak for our chapter of the Singing Women of Texas. We had members and their loved ones who had flooded in the storm, some of the churches we had planned to sing for were literally under water, several main South Texas roadways were closed, and gas shortages were looming. Only God knew what the outcome would be as we were forced to put a temporary hold on our first rehearsal and then our music retreat weekend. It took a good six weeks just to get back to a new normal for all of Harvey territory around the roads, gas stations, grocery stores and even our local churches. My parent’s home in the Meyerland area near Braes Bayou. The older I get and the more practice I have, it becomes much easier to exercise “Cast your cares upon Him, for He careth for you.” I chose to allow God to reveal his plans for our chapter in His time, not mine. Slowly but surely, I began to see that God had already gone before us and worked out many things ahead of our needs. Within the next eight weeks, FBC Friendswood would open their doors for a rescheduled Open Rehearsal, our retreat would graciously be rescheduled by Carolina Creek Camp, twenty-five members of the Dallas Chapter would step up and make a special effort to come and support us for our first Concert in Brookshire; and praise God, most of our members were able to pick up the pieces and return to us by that time. We are SO GLAD to be POST Harvey and back in the saddle for the 2017—2018 season. I am certain that God has a testimony in song to share through us. We have been through the waters and have emerged stronger and more faithful. Will you pray for us as we continue to serve Him the remainder of this year? As always, the Singing Women of Texas Southeast would love to partner with you and your ministry. Please contact us through our website (singingwomen.com) for more information about how you can be a singer or sponsor for a concert. Information for all chapters of the Singing Women of Texas can also be found there. Our next free concert will be held at the First Baptist Church in Grangerland, Texas on January 14 at 6:00 p.m. We would love to see you there! Pastor Jay Macintosh has supported us through the years and I would love to see a great turnout on behalf of his church. Our music is a welcome blend of hymns, inspirational music and patriotic selections. Check us out! On November 4, 2017, Brookwood Community in Brookshire, Texas will host The Singing Women of Texas (Dallas and Houston Chapters) at 3:00 p.m. in the Chapel. Both chapters will gather in the morning for rehearsal followed by an amazing lunch in the Brookwood Cafe. The Brookwood gift shop will be close by for some early Christmas gifts and decorations. The concert will be a blend of hymns and gospel music. The chapters will sing a few songs individually and combined. We invite friends in the area to join us for this special free concert. 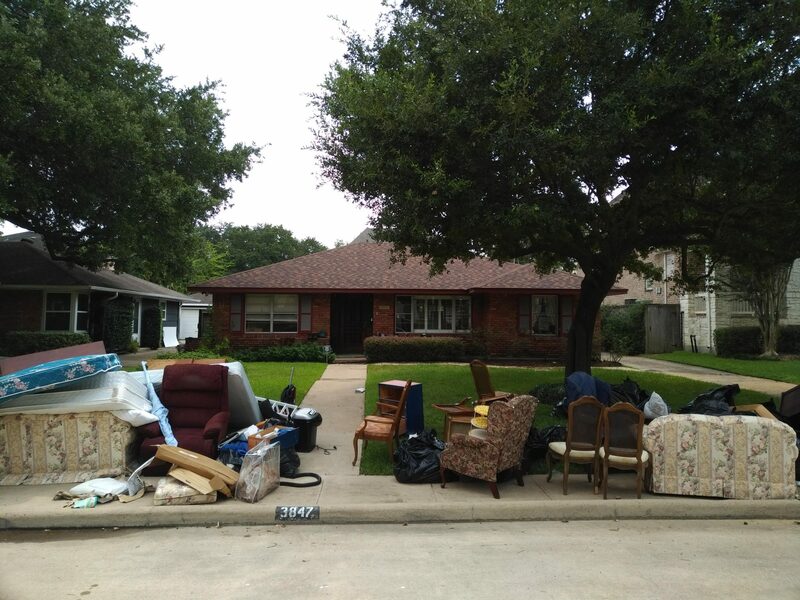 A Love Offering will be taken for Brookwood Community by members of the Houston Chapter. If you would like to contribute, please give your donation to a Houston SWOT member and make any check to Brookwood Community. We can email you a donation receipt. If you would like to keep in touch with us for future concerts, subscribe to this blog or visit singingwomen.com for more information. 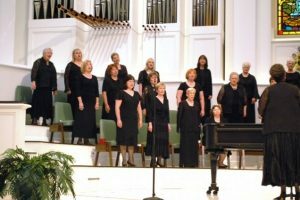 The Singing Women of Texas Southeast is a Greater Houston Area Choir for women. Visit our website singingwomen.com for more information about joining our chapter, or to locate chapters around the state. The Lord “ordered our steps” on our Lone Tour and took us to some amazing places and allowed us to meet some special people along the way. Our mission offerings were strong and our concerts raised several thousands of dollars for local and world missions. The biggest takeaway for me is always the old relationships rekindled and the new ones built through the experience. 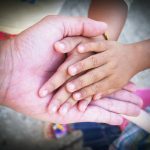 WHAT MISSION WORK DID WE DO? We sang, organized a food pantry, hoed sweet potatoes, painted a homeless shelter, ministered to senior adults and assisted living residents, handed out beautiful purses full of sundries to the needy, prayed and hugged on as many people as we could and we ATE! WHAT DID WE SING? Our repertoire was vast this year spanning across spirituals, gospel, inspirational songs, hymn arrangements and even a blessing that we sang at our meals. WHO WERE ARE DIRECTORS? We had eight wonderful choral directors present on this tour: Megan Smallwood, Lisa Gentry, Glynna Penney, Glenna Applewhite, Kay Payton, Lela Harris, Sharon Rainwater and Bari Brumfield. We also had instrumentalists, bus captains, tour guides, administrators and more. We were well-organized and cared for by Celebration Concert Tours (Phil and Sheri Barfoot) and our Texas Baptists state music liaisons (Karen Witcher and Tom Tillman). HOW LONG WAS THE TOUR? We met for 2 days for rehearsals and sang that evening at FBC San Marcos. Then, we traveled another 6 days across Texas. The Texas Baptists (BGCT) sponsored the tour and Celebration Concert Tours executed the travel plans and most of the meals. It was a great trip. HOW DID WE SPEND OUR FREE TIME? We raided the San Marcos outlet malls, ransacked Bucee’s, stormed the Alamo, traversed the Riverwalk, shopped here and there, laughed and played a joke or two (or at least I did). WHAT DID WE DO FOR BIBLE STUDY? Our wonderful chaplains (headed by Delma Talley) prepared wonderful morning and afternoon devotionals for us to prepare our daily journey into the mission field. Prayer time was a priority each and every day. WOULD YOU LIKE TO JOIN US? Visit singingwomen.com for more information about our chapters across the state of Texas. Singing Women of Texas is open to all ages of women and usually involves a short audition and generally a note of referral from a church minister. Contact us through the website for more information. Lastly, I will share with you a poem I wrote using the titles of our tour songs anticipating this trip. His Love is Like a River and it washes over me. The Lord is Ordering our Steps, of that we can be sure. That You are Lord of all the Small, Your love and grace abounds. I know You’ve Never Failed Me Yet, You always bring me out. Trials might be mercies in disguise, of that, I’ll keep professing. I know that Soon and Very Soon the victory is near. Our concert season goes by so quickly. Join the Singing Women of Texas Southeast Chapter for our final public concert this season at Praise Chapel of Houston on Sunday, April 23, 2017, 6:00 p.m. This will be our second concert at Praise Chapel. We love it because it is a spirit-filled church with a congregation who loves sharing the Gospel to the community. We will be singing a variety of Christian music including hymns, gospel selections, spirituals, and inspirational songs. Our concerts are always free and a love offering is taken to support our Mission Tours and other ministry efforts. All money goes to further our desire to spread the Gospel around Houston and throughout the state of Texas. Our singers come from around the Greater Houston area and some of them will drive a couple of hours one way just to sing for you. We would love to see you at our concert. It is for all ages and it will be a blessing for us if you come and share it. 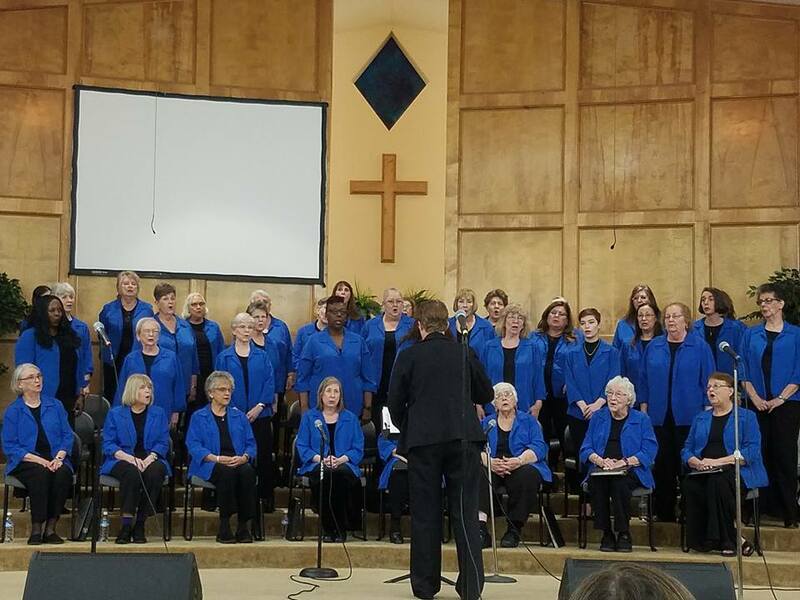 If you would like to be a part of the Singing Women of Texas Southeast, please fill out one of our contact forms found on our website: http://singingwomen.com. We would love to include you in our chapter next year. We have an easy audition process and are always looking for excellent singers who love the Lord and work hard. A statement of faith is required. We are BGCT affiliated, but not all singers are from BGCT churches. We are like-minded in our faith and our mission. You will meet some amazing ladies and establish lasting friendships being a part of this ministry. How do you explain to your congregation that thirteen of your faithful and loving senior adults were just tragically killed in a church bus accident? Where are the words? How do you stand firm when the entire foundation of the body is shaken? My heart has been burdened for the members and families of the First Baptist Church of New Braunfels as I share their pain for having to endure such a tragedy. I, too, work with a Senior Adult Choir that takes monthly mission and ministry trips on church busses, traveling up the road sharing Jesus and fellowshipping with Christian friends. It seems so unfair that the carelessness of one driver can cause such destruction. It is so easy to despair at what little control we seemingly have in this life. The Singing Women of Texas are singing a song this year entitled Lord of the Small by Dan Forrest. These lyrics come to me when I feel afraid, alone or insignificant. 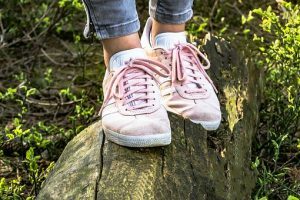 I offer them as a reminder that God loves us, He cares for us and He continually pours out His Spirit upon us, giving courage to serve and words to say, even when we are unsure. who sees the poor sparrow that cannot take wing. who comforts their sorrows and washes their feet. that the timid can serve and the silent can speak. they leave this tired frame and to paradise fly. to never be sick and never to die. He sees His dear children through mercy-filled eyes. First Baptist Church, I am praying for you. Many of us are praying and lifting you up in the days ahead. Addie was a member of our South Chapter of the Singing Women of Texas. She will be missed greatly. We know that your singers are singing in a heavenly choir, but they will be sorely missed in yours and ours. May God hold you and keep you and give you courage in the days ahead supporting your church family. Bari B. One of my favorite songs we are singing with the Singing Women of Texas this year is entitled “I Sing Because I’m Happy.” It is arranged by Kenneth Paden and adapted by Rollo Dilworth. Not only is it a great SSA arrangement of the chorus to “His Eye is On the Sparrow,” but it is also a very uplifting setting, slightly different than the familiar tune. The verse is not included in this arrangement, but the song is a response to the questions: Why do I feel discouraged? Why do the shadows fall? I have lived in those shadows. I have been discouraged many times. Hindsight always shows me how God carried me through those times and how He strengthened me. Foresight is not always so clear. I have to remind myself that God will deliver as He promises again and again. I need to trust Him and ask Him in the midst of the storm, “What do You want me to learn this time, Lord?” As I grow older, it gets easier to d o that. It doesn’t usually hurt any less, but my joy and my song are still easily found in the middle of it. I can agree with the lyricist Civilla Marin: “I sing because I’m happy, I sing because I’m free. 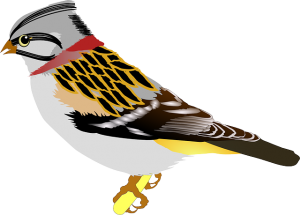 His eye is on the sparrow and I know He watches me.” Are you struggling today? Sing something. It doesn’t have to be perfect. It doesn’t have to be on pitch. Sing it to an audience of one—the Lord Jesus Christ. He is there, He is listening, and He cares for you even more than the sparrow. Visit a Singing Women of Texas Southeast concert this year by visiting our concert page.